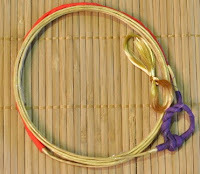 Yumi is an exceptionally beauty, long and asymmetric bow. Grip position is below the center. Its height is over 2 meters long. Basically, it was made from bamboo and wood. In modern day, It is also made from synthetic material. (Fiber glass and carbon fiber). The same as yumi. Ya or arrow is extremely long, around 1 meter, comparing to other modern archery. Shaft makes from bamboo attached with feather from large bird. (Eagle, hawks for example). Shaft also make from aluminium and carbon in present. Separated to 3 types, mitsugake(3 fingers glove), yotsugake(4 fingers glove) and morogake(5 fingers glove). It is a glove with harden thumb and wrist. The gloves are made from deerskin. 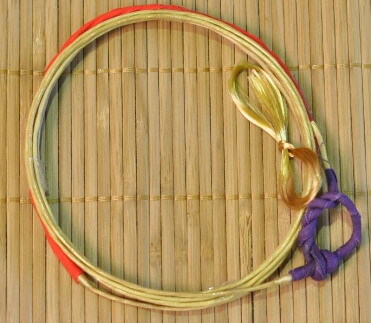 Tsuru is bowstring. It will be made corresponding to the length of yumi. Originally made from natural hemp. Standard kyudo uniform consist of Kyudo-gi (White kimono-like), hakama (Japanese traditional clothing), Obi (Sash) and tabi(Traditional sock).